The first wheelchair in recorded time dates back many hundreds of years, back to 500BC. Pictured on a Greek Vase, a young child is wheeled on what looks much like a hospital gurney. While this image does not represent what most would think of as a wheelchair today, this marks the first record of a personal wheeled vehicle. In fact, it would be many years before the traditional wheelchair design would be born. Over the next thousand years, there would be several recorded wheeled chairs, but it was not until the fifteen-hundreds, that a smaller more traditionally designed wheelchair was created. The King of Spain ordered the building of a wheeled chair that could bring him to and from the garden. ** The chair that resulted was similar to a pool chair, with a long reclining backrest. This chair is unique, because it had a footrest, which kept the King in place. While King Phillip was ruling Spain, the country was at its peak in power and extremely prospourus. The chair designed for King Phillip II was designed for comfort and not out of particular necesity. As a result, this chair was not self propelled. However, the first self propelled chair was not far away. 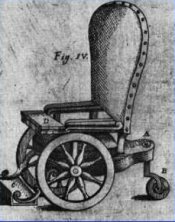 Sixty years after the creation of King Phillip’s wheeled chair, in 1655, a young watchmaker built the first self propelled chair. At the age of 22, Stephen Farfler, who was a paraplegic, built a three wheeled hand powered chair. This device, which looks similar to a mobility scooter, was powered by a hand crank at the front of the vehicle. A chair with a similar design would be created in Bath, England almost a hundred and thirty years later in 1793. This wheeled chair also used a three wheeled design, but needed someone to push it. The front wheel could be steered by the occupant and these chairs became very popular in Bath. At the time, Bath’s numerous hot springs and Roman baths were very popular. Many people came to bath who had difficulty walking, so the three wheeled Dawson chair, named after its inventor John Dawson, was in great demand. During the nineteenth century, several changes to the wheelchair would take place that dramatically changed the reliability and usability of the wheelchair. Wooden wheels would be replaced with steel rimmed wheels, some using a hollow air filled rubber tires. Push rims would also be added to the tires. While during this time period, there were several self propelled wheelchairs, they could be difficult to move if they got stuck in some mud or an area with very loose soil. Up until this point, the wheelchairs had required that the user spin the large rear wheel with their hand. Beginning in 1881, a smaller circular steel tube was attached to the rear wheel. This circular tube, made turning the wheel easer, because the user could grab the tube instead of directly grabbing the wheel. Pushrims became standard and provided a better means of spinning the wheel. Until the 1930′s, the wheelchair was a rather cumbersome device. They were bulky and while a lightweight wicker wheelchair had been built, even this could not be easily transported, making traveling very difficult for many wheelchair users. Harry Jennings, who was an engineer, saw how his friend, Herbert Everest, struggled with his wheelchair. Jennings decided to do something about it and with the help of Everest, he would create a lightweight foldable wheelchair. The chair quickly became popular and the E & J chair was born. This chair used a simple folding design and hollow steel tubes, making it very easy to transport. This design is still used extensively all over the world and is still the basis for most manual wheelchairs. About twenty years after the invention of the E & J wheelchair, the first electric wheelchair would be built. This chair utilized the E & J frame, outfitting it with an electric motor. A simple hand control was mounted on the handle bar of the chair. New control methods were also created at this time, including those that relied on head movements to control the chair. As the popularity of this first electric wheelchair began to unfold, many companies began selling converter kits that allowed an existing E & J wheelchair to be made electric. Today, there are many electric and manual wheelchairs to choose from. Many off road and alternative wheelchairs are available. These chairs have changed a good deal since the early Greek wheeled vehicle, but many of these early wheelchairs helped to mold the wheelchair of today.